When every September comes, it means that the cold season is drawing near, and if you’re a camper, that might raise a red flag. But I don’t need to tell you what you already know. The future, as we call it, has its drawbacks, but the improvements in comfort are indisputable. If you’re not familiar with the concept of a safe tent heater, this is a device that allows you to heat your tent without causing any sort of harm to you and your loved ones. The gases burn clean and controlled, the same being true for the heat dispersion. 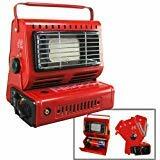 Let’s continue by reviewing some of the best camping heater options. Throughout the tent heater reviews, we’ll be discussing features, fuel capacity, type, price and more. Although basically, every camping heater out there operates under the same principles, there are some differences between them, differences that will influence your decision. Let’s take a look at what you need to consider and what information you need to have before choosing what the best heater for tent camping is for you. Portability. Although they’re all relatively portable, they obviously come in different sizes. Some serve as stoves while others might be too small and won’t suffice, depending on your needs. These heaters aren’t great just for camping, but for emergencies too, like hurricanes or other natural disasters, and some people like to have a backup plan. Tent/Room size. Some of these heaters operate using pre-determined mathematical formulas, formulas that the manufacturers will provide and you’ll use to figure out how much heat and power you need in order to keep an optimal temperature in your desired environment. Don’t overdo it if you’re just buying one for a small tent, and don’t buy something that’s not going to be able to output the necessary heat and power for a bigger room. Accessories. Some heaters can be used with different accessories like gas filters and hoses, accessories that can greatly improve your camping experience. You don’t have to use a one-pound propane tank when you can use a forty pound one if that’s going to make your life easier. It’s also more logical to take only what you need, so these accessories might make things easier on several levels. That being said, let’s take a look at the products. Mr. Heater is America’s top camping heater manufacturer, gaining a lot of experience and notoriety over the years. Currently, Mr. Heater Buddy ranks as the number one most bought item in this niche, and we’re not surprised. Mr. Heater offers plenty of power for its size and is very, very portable. This propane-powered safe tent heater brings a lot of utility to the table. Although the price is a bit steep when taking a look at the other products the market has to offer, it’s not expensive – it’s just not as cheap as other options. This can output between 4,000 and 9,000 BTU (British thermal units), enough to provide heat for up to 225 square feet of closed space. Designed to operate both indoors and outdoors, this little guy can really make a difference when it comes to your camping experience. A tent or an RV is no problem for Mr. Heater Buddy. Clean-burning and high efficiency are a must when using something that’s potentially dangerous. Just place it accordingly, and you won’t have any problems. Mr. Heater Buddy has a swivel-out regulator so that you can attach a one-pound propane tank without any awkward positioning. If that’s not enough for you, the manufacturers have issued a list of all compatible accessories that can allow you to connect up to a 40-pound propane tank. Moreover, starting this thing is quite complex, so you won’t accidentally turn it on. It even has a sensor that will stop it when oxygen levels reach a certain threshold. 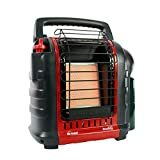 Being equipped with heaters for tents during winter camping is essential, and while you’re researching the market, you might stumble across this product, which is very likely to happen. The people at Mr. Heater, one of if not the best company that makes such devices have come up with an even more compact version of the buddy – the Little Buddy. The Little Buddy weighs only 5 pounds – a little more than six pounds when attached to a small propane tank. This means that you can take it virtually anywhere with you, without having to worry about packing. The fact that it’s this mall does have its drawbacks, yes, but it also has a lot of advantages. It can heat a space up to 95 square feet, outputting up to 3,800 BTUs, a little less than half of Buddy’s capabilities, but that’s enough for tents and RVs. It has the same filters and safety features that are present in its larger variant – once the oxygen levels reach a certain threshold, the heater will automatically stop, causing no harm and putting you in no danger. Because it’s this small, it also has a tip-over safe system, so that if you trip on it, it will immediately stop functioning, keeping you out of harm’s way. The device can be powered by using a simple on-off button, which, I’ll admit, isn’t all that safe. The Buddy had a more advanced system that would be more secure, something to take into account if traveling with children. Other than that, it’s a very nice product – a great gas tent heater. The people at Tooluze have made an entry on the camping market with this product – the Camping Emergency Butane Heater – I know, not the most inspired name, but that’s not the problem. Ranking number 3 on our tent heater reviews (although this doesn’t mean it’s the third best product), this heater has a new feature – it can be positioned at different angles. This is great because you might need more heat focused in a certain area. I usually use heaters to warm my freezing feet, and with other products, I’d have to place them on a stool or something of sorts, but this has that problem solved. That being said, it’s all downhill from here. Its BTU output is around 600-700, very, very little. That’s not everything, this isn’t even designed to be used in indoor environments, maybe because of the lack of safety measures that we’ve seen on previous products. While it’s not all bad, it certainly doesn’t measure up to expectations. The bottom part features some controls and a storage compartment for small, propane gas tanks and a gas release vent. It has a nice handle that makes it easy to carry around and manipulate. Design-wise, I can’t say I’m a big fan. It’s pretty bad looking – this is far from the best heater for tent camping. The fourth entry on our safe camping heaters for tents list, the TMS portable Military Camping Stove is more unique than what we’ve seen so far. TMS is a company that produces kettles and stoves, meant for camping, and it does that beautifully. The TMS Portable Stove is, as the name implies, a stove. It can also be used for heating purposes, but it really shines when used for cooking. While this is a great product, it has both benefits and drawbacks. First, let’s talk about the fuel. This product uses wood for heating. While this isn’t a problem per se, it’s not as safe as using the previous products, especially for indoor (or tent) uses and is to be used only with certain types of tents and RVs, so that you can safely dispose of the gases. It does have some safety features, such as a spark arrestor that will prevent any emission of flammable debris from inside the stove and an extendable pipe vent, but you can only use this in an open tent. All in all, it’s a pretty good choice for those interested in heaters for tents during winter camping. In addition, this comes with removable grills and legs, so you can use it for heating, cooking meat (great for ice fishing), baking potatoes and other things that you can think of. As long as you’re careful about how you use it, it’s can be a really great product. Texsport is one of the biggest manufacturers on the outdoor market, producing tents, camping furniture, propane products, and hammocks. These guys really know what they’re doing. The Portable Outdoor Propane Heater made by Texsport is a very portable, very small product. It’s great for use in the outdoors, and you can even use it in a tent or RV if you’re careful with it. It has a nice power output of up to 2,800 BTUs, impressive for such a small heater. 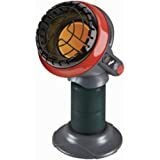 This last choice for our safe camping heaters for tents product roundup is very portable, has a nice base with four anchor points and just has to be mounted on top of a small propane tank to be used. It comes with a regulator, to easily control the energy output, an aluminum reflector that will focus the heat in one direction and a nice carrying handle. The Texports Outdoor Propane Heater will automatically cut gas flow in case the fire runs out, adding a bit of safety to the mix. That being said, only use it in well-ventilated environments, because it lacks an oxygen sensor and won’t stop burning if you run out of the air. Now that we’re done reviewing the five heaters, you should know that all of the products are great and each will provide a lot of value of properly used. Depending on your needs, certain items might prove to be more useful than others, regardless of our opinion – just know that you can rely on each and every one of them.